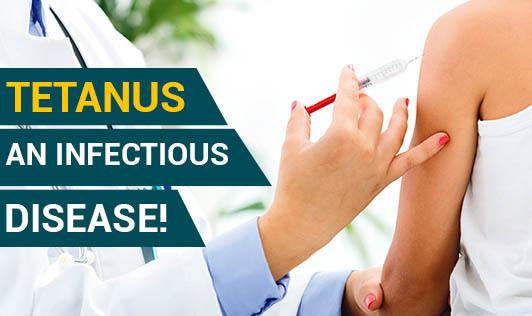 Tetanus -- An Infectious Disease! Tetanus is caused by the bacteria Clostridium tetani. It is an infectious disease caused by contamination of wounds. They are present in the spores that live in the soil, and animal feces. The causative bacterium, Clostridium tetani, is an organism capable of living many for years in the soil in the form of spores. Tetanus spores are found throughout the environment, usually in soil, dust, and animal waste. The usual locations for the bacteria to enter the body are open wounds, rusty nails, insect bites, burns or any break in the skin. Visit the doctor immediately if you find any of these symptoms. In rare cases, surgery is also done to clear the wound. Tetanus immunization has to be taken. Each immunization will last for 12 years. Thorough cleaning of all injuries and wounds and the removal of dead or severely injured tissue. Not using rusty nails will also help you avoid tetanus. Stay clean and healthy and lead a tetanus free life!